This September the Point Breeze neighborhood was a buzz as the former Breezy’s Cafe was transformed into On Point Bistro. Open for brunch and dinner, this neighborhood spot is a cozy, quaint BYOB with really delicious food. What we love even more than good food, is a family that is behind it- Mallory and Megan are identical twin sisters who joined together with their husbands to open up the restaurant. 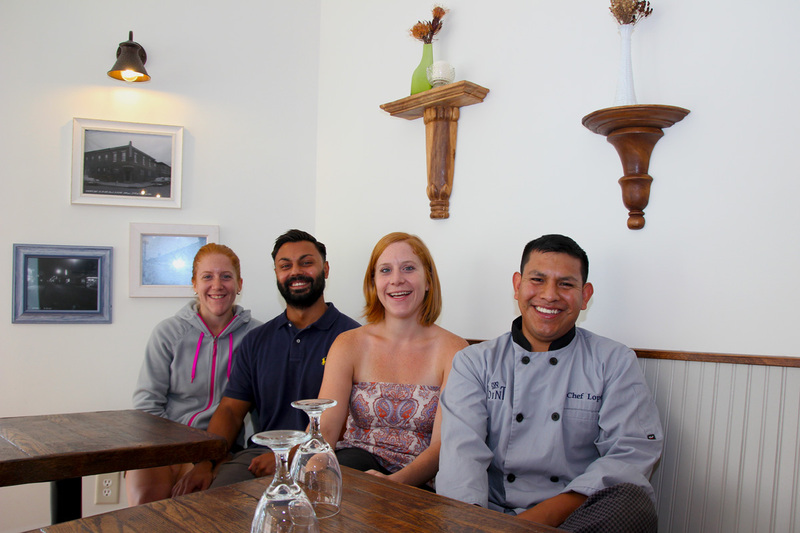 The Executive Chef Juan Lopez is married to Mallory and met her while working in the restaurant industry. Chef Juan has lots of experience in the industry working with Amada, Garces Trading Company, and Garces Catering at the Kimmel Center. Chef Juan’s menu is built around comfort foods made exceptionally well. Specials also offer customers the ability to try something new. For upcoming Valentine’s Day weekend guests can select from a special menu available Feb 10-11, and 14th including dishes like Trout Crostini with pan seared trout with leek gratin, Baby Arugula Salad with toasted almonds, figs, and sherry vinaigrette, Crab Cakes with celery root purée, and grilled asparagus, Grilled Lamb Chops with roasted marble potatoes, pearl onions, romesco purée, and lamb jus or Gnocchi which are house made potato gnocchi with bacon lardons, brussel sprouts, mushrooms, and fontina cheese (can be made vegetarian). Dessert is provided by Essen Bakery. Stop by Tuesday-Saturday to enjoy lots of affordable dishes on their dinner menu. We recommend an order of the Pork Steamed Buns with hoison sauce, pickled daikon, pickled fresno chili and aioli. These Asian style buns are soft and pillow-like while filled with slow-cooked pork belly that melts in your mouth. We’ll be back for an order of the Mussels & Frites with spicy white-wine tomato broth and the Wings with habanero glaze, blue cheese crema and seasame seeds are a big seller too. And when you BYOB its perfect to pair your wine with some Charcuterie or Cheese Plate. If these colder days have you ravenous and craving comfort foods, we’d suggest the Short Rib Mac & Cheese, we ordered this entree as a starter since we just couldn’t leave without trying it. The dish is big and very filling with loads of melty gruyere cheese and tender braised short rib topped with lemon gremolata. Served in a cast iron dish this plate is also steaming and piping hot when brought to the table. Not to be overlooked at On Point are the burgers. The classic On Point Burger with fries features an 8 oz. beef burger with Boston Bibb lettuce, Thousand Island sauce and option to add provolone, cheddar, and/or bacon. Vegetarians and vegans will love the Falafel Burger with mixed greens served with cucumber, tomato, red onion, and feta labne sauce. Both these burgers are half priced every Tuesday when dining in! Plus on the third Thursday of each month $2 for any burger sold ( both dine in and takeout) goes to a local non-profit, Neighbors Investing in Childs Elementary (NICE) that supports GW Child’s Elementary School. For dinner we also highly recommend the Grilled Salmon, each 6 oz. filet is served over green lentils, bacon lardons, horseradish crema, and drizzled with balsamic reduction. This dish totally blew us away, just looking at the presentation you knew this plate was going to steal the show. The Fish & Chips with fried cod, house made tartar sauce, pickled mustard, cucumber, and pickled red onion salad is popular, as well as the Lancaster 1/2 Roasted Chicken with yukon mashed potatoes, caramelized cipollini onions, and roasted carrots. Desserts selections are provided by Essen Bakery.